When you purchase a set of four (4) select Goodyear tires, you may be eligible to receive up to a $100 Goodyear Prepaid Mastercard Card by mail-in rebate. 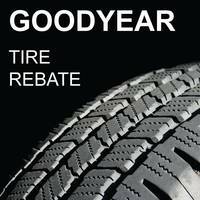 Offer valid on qualifying tires purchased at an authorized dealer, and picked-up or installed between 12:00 a.m. EDT April 1, 2019 and 11:59 p.m. EDT June 30, 2019. Offer valid only for U.S. residents who are individual consumers with mailing addresses in the U.S. or U.S. territories (American Samoa, Guam, Northern Mariana Islands, Puerto Rico, & U.S. Virgin Islands) including APO/FPO addresses. See dealer for complete details.